Happy holidays to you all (whether your holiday of choice has already occurred or is coming soon)! P.S. 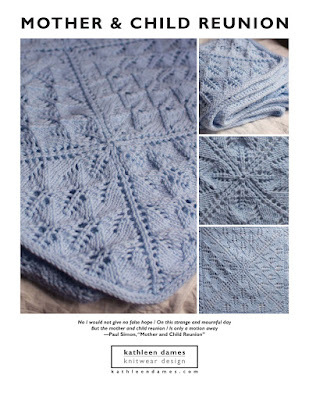 More knitting in the New Year - promise! At some point about a year ago, I got it into my head to conquer pizza. I'd tried making dough a dozen years ago and ended up with a long-standing fear of yeast. 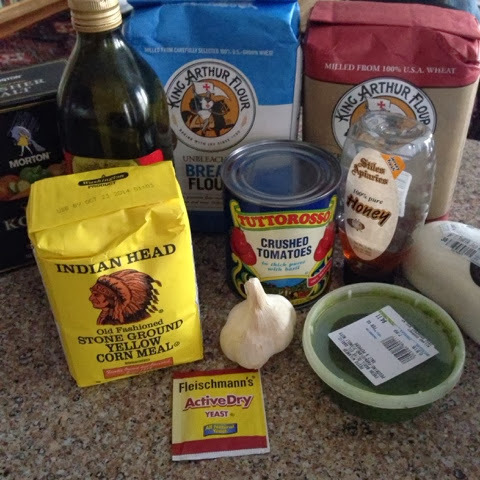 I'd made a big mess in my kitchen and then discovered that you could buy ready-made dough from the store. For whatever reason I finally decided to face my fears and researched a lot. 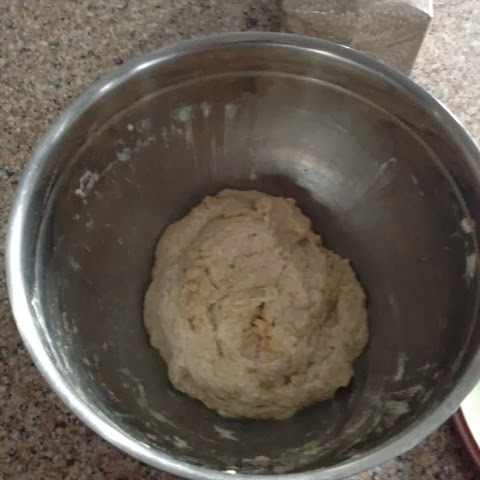 The interwebs told me I could make a dough without a lot of kneading (and Cook's Illustrated helped) and could roll it out without everything getting coated in dough bits - not quite as much fun as tossing it in the air, but just as tasty (and feasible for me). 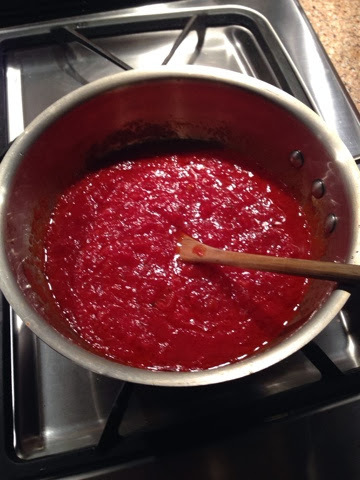 Cook's also started me in my sauce path, though the addition of basil into the sauce via the crushed tomatoes was my own genius (I wanted the flavor but knew the kids would object to big green leaves on the pizza plus finding nice basil all year round just isn't in the cards. The internet also gave me the idea to incorporate the broiler. Anyway, the best thing is how forgiving the dough is. No specialized equipment needed! No Kitchenaid, Cuisinart, or laborious kneading. I think you could even get away without pizza tiles and peel, just using a couple of baking sheets (one in the oven to heat up and a second to get the pies into and out of the oven). Mix up that dough and leave it alone. It only requires a tiny bit of planning to have your own scrumptious pizza! Whisk flours and yeast together in large bowl. Whisk water, salt, oil, and honey together in two-cup liquid measure (or small bowl). Pour liquid into flour mixture and mix together with rubber spatula. If mixture is dry, add 1-3 teaspoons of water. Dough should come together into a shaggy ball at this point. Drizzle oil into bowl and roll ball to coat it and sides of bowl. Cover bowl and set aside to rise for at least an hour. If you won't be proceeding for more than four hours, refrigerate for up to eight hours. Preheat oven with pizza stone or tiles set on middle rack to 500 degrees 1 hour beforehand. Uncover, punch down dough, and reform into a ball. Sprinkle clean counter with flour and divide ball into four. Sprinkle balls with flour and cover with plastic wrap for approximately 30 minutes. Sprinkle a handful of cornmeal onto a sheet of parchment paper and place one piece of dough in center. Cover with plastic wrap and press dough to flatten. Repeat with remaining three pieces of dough. 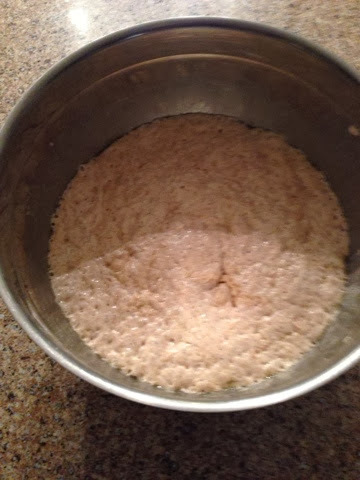 Roll out dough allowing it to rest for a few minutes at a time until you have an oval approximately 10 x 14". Heat olive oil in saucepan. Add garlic and tomato paste and heat for 1 minute. Add crushed tomatoes and simmer for 30 minutes. Set aside until ready to use. 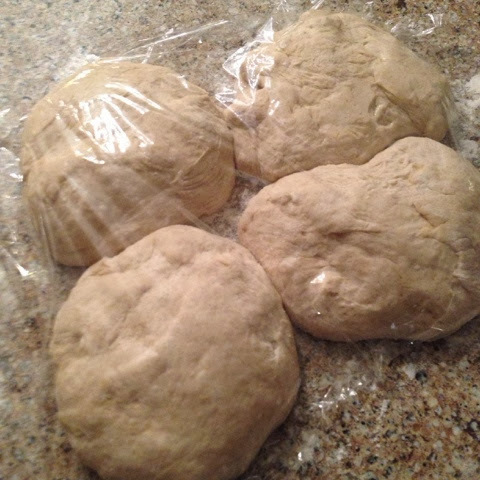 Remove plastic wrap carefully from dough. Spread 1 teaspoon olive oil over prepared dough "round". 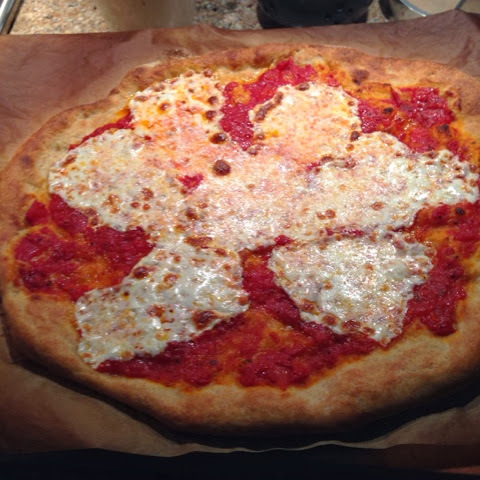 Spread 3-4 tablespoons tomato sauce over dough (a thin layer is best or crust will be soggy). Place 1/4 of the cheese evenly over sauce. 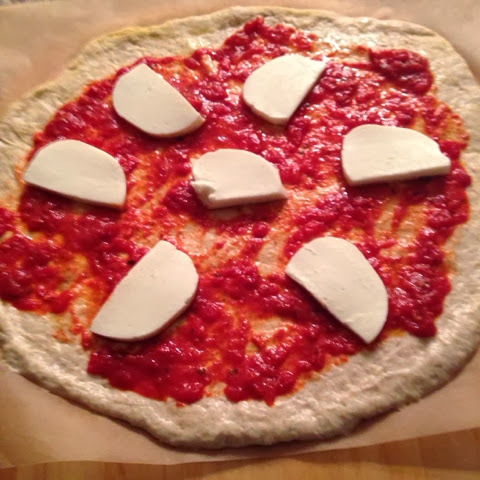 Slide pizza onto preheated stone and bake for 6 minutes. Switch to broiler for 2 minutes. Remove from oven, switching back to 500 degrees and allowing oven to return to temperature. Slice pizza and serve. 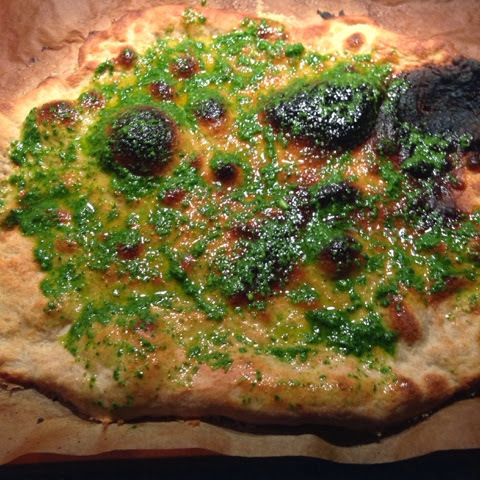 I usually blind bake one pizza round with just olive oil and then spread pesto over it after it comes out of the oven. Remaining sauce and cheese may be frozen for future use. Dough balls may also be frozen, but I always make four pizzas. In our house it's called "Mommy Pizza" to distinguish it from delivery. The crust is thin and crisp and the sauce quite tasty. Let me know if you give it a go, and thanks for stopping by! 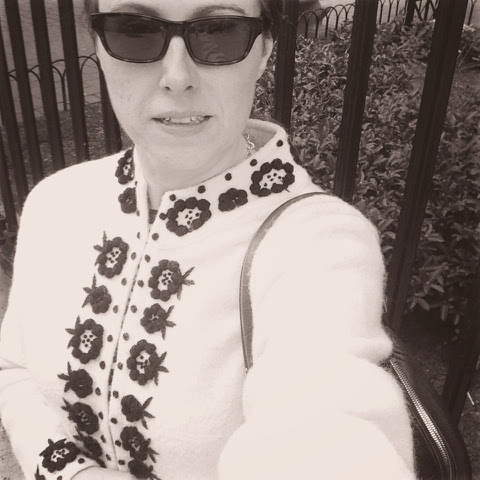 The weather is a bit warm now that we are back home, so the sweater posting has slowed down (if you follow me in Instagram, you've already seen these). 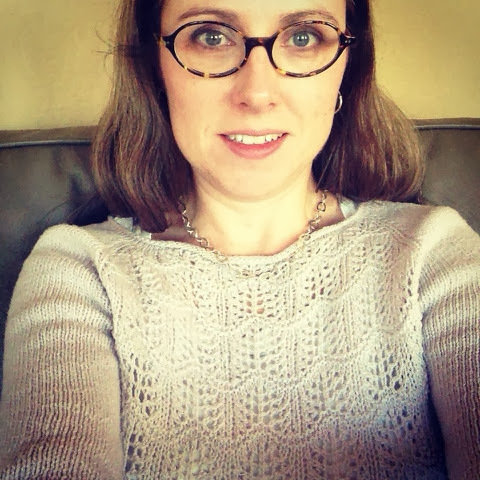 I'm ok with wearing a button down today but do look forward to more sweater wearing soon. I hope you had a happy Thanksgiving and stayed away from the mall and big box stores. 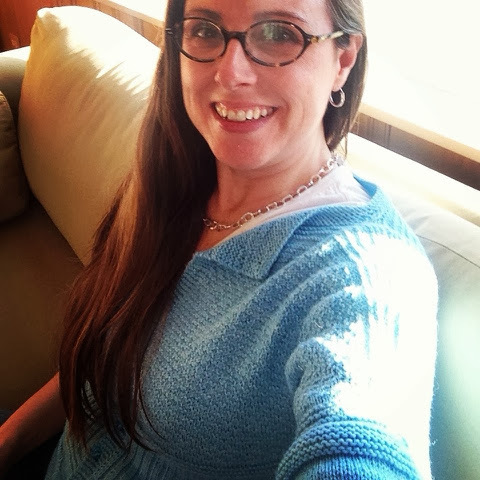 I spent some time browsing etsy and making plans for some last minute knits and worked on that simple stole. 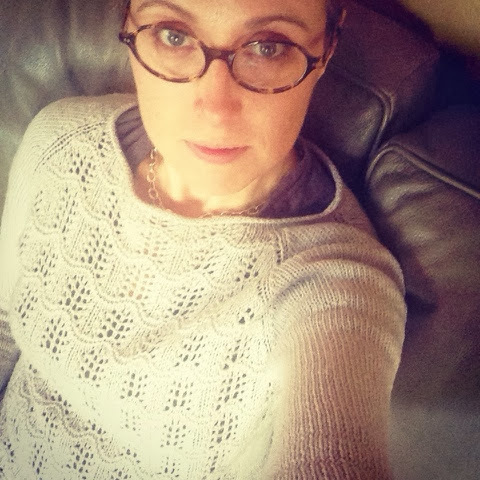 It's very good comfort knitting.